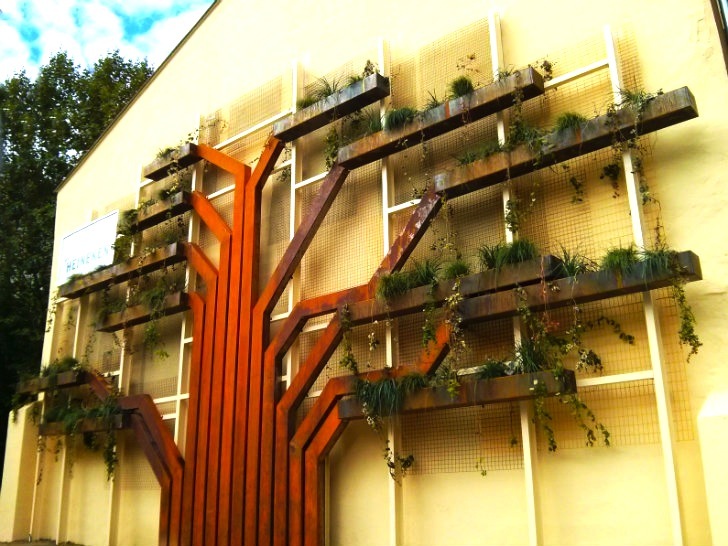 This new installation in Vitoria-Gasteiz is both a tree and a vertical garden. Designed and built by Urbanarbolismo and UnusualGreen, the vertical tree garden adorns the side of a building facing the Green Capital Plaza in northern Spain. The trunk built out of steel acts as the conduit for an irrigation system that waters the planters at the end of the branches. And while the tree is looking slightly sparse now, the ivy and grasses will eventually grow beyond the planters to become a full and leafy tree. The vertical garden was designed to act as a tree and a green installation on the side of a building facing the square. Weathered steel conduit act exactly like a tree trunk to provide support and irrigation services to the plants at the end of the branches. The planters are specially designed and a new system for Urbanarbolismo and UnusualGreen. Their Eco.frame system consists of a substrate container structure where vines colonize and grow on different kinds of metallic meshes. The tree structure is supported by another mesh structure behind it, which is kept off the building and does not cause any damage to the historic structure. A variety of plants were installed on the vertical garden to create greenery throughout the year and includes a number of weather resistant and mainly deciduous grasses and ivy. They used the following vines: Hedera helix “Gloria Marengo” (Ivy), Humus lupulus (Hops), Periclymenum Lonicera (Honeysuckle), Partenocissus quinquefolia (Virginia Creeper), Partenocissus tricuspidata (Virginia Creeper), Vitis vinifera atropurpurea (Red Vine), and the following grasses: Carex gigantea, Carex pendula (Cattail). 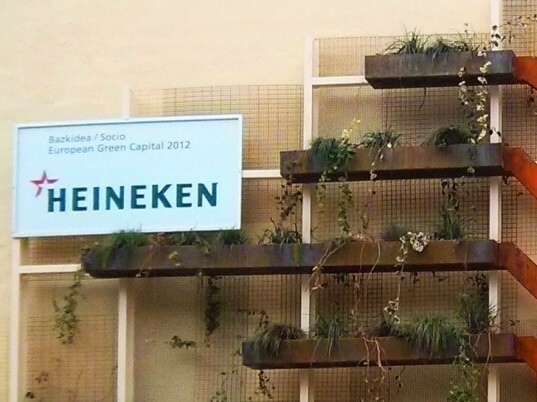 The vertical garden was designed to act as a tree and a green installation on the side of a building facing the square. Weathered steel conduits act exactly like a tree trunk to provide support and irrigation services to the plants at the end of the branches. The planters at the end of the branches are specially designed and a new system for Urbanarbolismo and UnusualGreen. Their Eco.frame system consists of a substrate container structure where vines colonize and grow on different kinds of metallic meshes. The tree structure is supported by another mesh structure behind it, which is kept off the building and does not cause any damage to the historic structure. A variety of plants were installed on the vertical garden to create greenery throughout the year and includes a number of weather resistant and mainly deciduous grasses and ivy. They used the following vines: Hedera helix "Gloria Marengo" (Ivy), Humus lupulus (Hops), Periclymenum Lonicera (Honeysuckle), Partenocissus quinquefolia (Virginia Creeper), Partenocissus tricuspidata (Virginia Creeper), Vitis vinifera atropurpurea (Red Vine), and the following grasses: Carex gigantea, Carex pendula (Cattail).